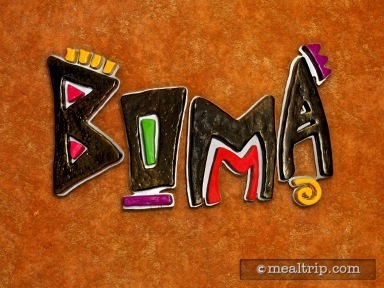 Animal Kingdom Lodge offers a great African-inspired buffet called Boma. The location is still character-free (most buffets on Disney property are also character meals), and is only open for breakfast and dinner. While the space was designed to resemble an African marketplace, at night, some of the design cues tend to get obscured. It's still a great looking space, but fine details like the thatched roof, wall paintings, wood carvings, and the ceiling hanging rugs get a bit lost in the shadows. There is a giant on-stage kitchen where most of the food is being prepared, and while it's somewhat hard to see while sitting, it's a neat part of the feel of the restaurant when you go up to the buffet line. That "line" as it were, is really many different paddocks all lined up, and it's not necessary to wait in line at the very end to get to where you want to go. Often times, a smaller line of one or two people form behind the very station that you want something from. The foods are refreshed frequently and the system here seems to run quite efficiently. There are over 50 items on the buffet that are inspired from more than 50 different African countries (how did they do that?). There are usually some breads and dips to sample, along with cold prepared salad mixes like a Tunisian Couscous Salad and a Watermelon Rind Salad. Soups have been a much talked about staple at Boma for years, and for good reason... they really delicious, high-grade soups. The flavors change from day to day, so you may want to check with the chefs or restaurant staff if you really want a specific flavor of soup on your next visit. Some options include a sweet Butternut Squash Soup, Seafood Gumbo, Coconut-Chicken-Curry Soup, Cape Malay Lamb Stew, Carrot-Ginger Soup, and a new Buerwors Sausage Stew! Hot food items that are often featured are a dinner style Bobotie, carved Turkey and Spiced-Crusted Beef Sirloin, Pork Shoulder with various sauces, Durban-style Roasted Chicken and a Nut-Crusted Roasted Salmon. There is also a smaller (less tall) kid's station as well that features items like chicken and fish nuggets, pasta and meatballs, and Mealie Dogs (hot dogs). The hard part about eating at Boma, is leaving room for dessert! There's one item that has gained legendary status at Boma, and that's the Zebra Domes! They are an amarula mousse dome covered with a chocolate ganache and striped like a zebra! So good… and available in a non-alcoholic variety as well. In addition to some fresh baked cookies and brownies, there is a hot bread pudding, apple cobbler, and several mini-tarts that change seasonally. Kenyan Coffee Tarts and a Guava Panna Cotta have been around for a while and are close to being regulars on the dessert menu.